A mother’s love is stronger than death, but love and death walk hand in hand when mortals cross paths with the immortal fey of Cold Mountain. 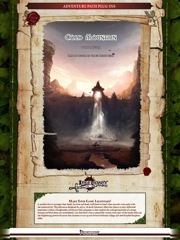 This adventure designed for 4th level characters stands on its own as a lush atmospheric journey into the dangers and mysteries of the wild, but it is especially suited for characters in a Kingbreaker Adventure Path campaign as they explore the unforgiving lands of a savage frontier and find them not uninhabited. As their kingdom expands, can your heroes manage to forge peace with the xenophobic clans and cold-hearted fey of the lonely hills and the frightening fury of nature itself that threaten to rise up and devour barbarian village and new-founded kingdom alike? Written by Jason Nelson, with art by Frank Hessefort and maps by ENnie-award-winning cartographer Todd Gamble, this 47-page epic adventure features 3 new/variant creatures and a variety of harrowing challenges of mind, heart, and strength. 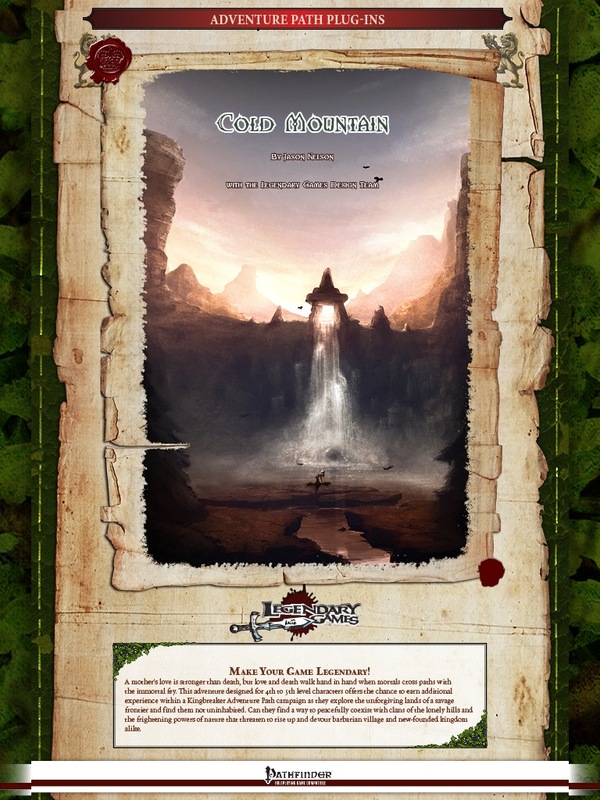 Cold Mountain continues Legendary Games' tradition of bringing you outstanding content by the best authors in the business, combined with amazing art and production values and innovative layout design, including a 4-page appendix of player-friendly text-free map handouts. We hope you enjoy using our products as much as we enjoy making them, and that you'll keep coming back again and again to Make Your Game Legendary! This plug-in adventure for the Kingmaker-AP is 47 pages long, 1 page front cover, 1 page editorial, 1 page back cover and no SRD, leaving us with 44 pages of content, so let's take a look, shall we? From here on out, the SPOILERS reign in this adventure-review, so potential players should jump to the conclusion right now. All right, still here? Very well! The Ughar dread the goddess of a mountain, one Istria, is angry with them and they are just about to start a lottery for the sacrifice of one of their own when they contact the outsiders to perhaps help and stop the killings of the enraged "goddess". Following the trail of the call of help, PCs need to brave the deadly random encounters in the wild before reaching the gloriously-mapped Ansit Fjord and traverse it without falling to the voonith and a local owlbear, traversing the seriously cold, rugged terrain further on towards their destination. Snow storms, moss troll and bloody victims do not bode well for the things to come, though it should be noticed that we also get a fully grid-studded map of the aforementioned encounter before the PCs reach the isolated and now cursed hamlet of Gloym - which again comes fully mapped. When a woman called Priya lost her family to the cruel fates, in despair she turned against her fey goddess and perished - her anguish returning her as a spirit that has since possessed one of the minions of her erstwhile fey "goddess", forcing the nixie to commit acts of vengeance and perpetuate her suffering. The climax at the Falls of Istria will thus not only be terrain-wise, but also strategy-wise interesting, offering a variety of ways to deal with the threat -diplomacy, magic, brute force - all possible. After that, the PCs will need to ascend the sacred mountain and petition with the goddess - while the result may see aforementioned tragic spirit laid to rest, that is by far not the end - the curse unleashed lingers and the goddesses spriggan-companions will surely not try to help the PCs. Hunting down a deadly beast via an extended hunting-session/clever traps then sees the PCs retrun victorious - but only if they have managed to glean the beast's weaknesses. Worse, it had infected some villagers with wendigo fever and the accursed sickness has already started its rampage - whether by acting swift and decisively or by killing those that are destined to succumb to it in self-defense, a bitter-sweet taste remains. And on the way home, there's yet one more battle to contend with - the spriggans want to slay the meddling outsiders that spoiled their fun... one final, deadly battle thus ends the module. The module also comes with stats for the new type of fey the goddess represents as well as a nixie-variant, the lesser wendigo template and player-friendly versions of all 4 glorious maps. Editing and formatting are top-notch; i didn't notice any glitches. Layout adheres to a portrait-standard with 3-columns (personally, I prefer 2-columns, but oh well) that surprisingly remains easy to read. The pdf comes fully bookmarked and hyperlinked with the good, useful type of bookmarks. The artworks and maps are gorgeous - especially the former, and rank well among the most beautiful you can find in any publication. Evoking a culture somewhat inspired by Native American tradition, this pdf offers a detailed, evocative glimpse at a cool culture and belief-system as well as serving to foreshadow some developments throughout the AP. From great combats to nice skill-based challenges and fights that reward not slaying everything that shows up on the pointy side of your PC's swords, this plug-in might not steal the show of legendary modules - but it doesn't need to - its focus lies on natural beauty, harsh environments and the tragedies that are part of the circle of life. A glorious addition to any Kingmaker-campaign, easily inserted into Adventureaweek.com's Vikmordere-context or with minor reskinning working just as well in a Northlands context, this module is a true winner not only for its intended AP and well worth 5 stars + endzeitgeist seal of approval. Kingbreaker Plug-Ins off to a flying start! Cold Mountain is a 47-page PDF that starts off a new line of plug-ins meant for use with the Kingmaker AP. It has four full-color maps, one page for the cover, one for credits, and a back cover that lists some of Legendary Games' other products. That leaves roughly 40 pages for the adventure itself, so here goes. The adventure is for 4th level characters and meant as a way of injecting some straightforward adventuring into the early exploration of their new kingdom. The PCs' land has been having trouble with weird and brutal killings by... something, that cannot be identified. Some believe that the nearby Ughar hillfolk might be involved -- and then they approach you to beg for help with the exact same problem! If it's not them, then who or what is responsible? This leads into a mixture of combat, investigation, exploration, and diplomacy in an adventure that deals with grief, loss, supernatural revenge, the immortal jealousy of the fey and the wrath of the windigo. The adventure has a nice mix of roleplay, combat, skill use and exploring, and it presents some cool new monsters as well as a template that does a great job of presenting an infectious and terrible curse to deal with. The rewards if you do well and pretty good, involving some new allies both human and inhuman as well as some new resources for your kingdom. And it plays into the themes of the larger campaign as well. Really a good piece of work and a great start for what promises to be a exceptional line of Campaign Plug-Ins. Five stars. I have this one and it's a pretty good piece of work. Woo! Come and get it! And thanks Eric for the positive review! Who are the Ughar hillfolk? I get the impression they're not the Tiger Lords (who are up to the north-west of the Stolen Lands). Is there a particular group of tribes in the south-east that the Ughar represent? Daronil: I think the Ughar are just a local minor tribe. My own take would be that the Tiger Lords managed to wipe out of absorb most of the other local Kellid tribes, so all that's left is little groups like the Ughar, who seem limited to one small village. Eric has the right of it. The Ughar are intended to represent a small isolated tribe in the foothills of the "Eastern Tors," just a collection of small scattered villages like Gloym (there are a few other villages mentioned in the text, like the one that Ganec Trom travels to). They don't correlate to any named tribe in the published AP. Reviewed first on Endzeitgeist.com, then submitted to GMS magazine and Nerdtrek and posted here, on OBS and d20pfsrd.com*'s shop. Cheers! Thanks for the great review, Endy. Reposted and linked over at our website and much appreciated as always. This adventure was kind of a pet project of mine from way back, and it's great to see the positive response. If anybody out there hasn't taken a look, check this adventure out! Glad you loved it, and we do work hard to make adventures that you can port anywhere while still fitting great into the APs. I thought this one had a fun balance of fights, roleplay, and problem-solving, and glad to hear you and Eric thought so too in your reviews. I highly suspect that I missed seeing the relevant information somewhere in my current sleep-deprived condition, but which hex(es) are the locations in the adventure here are intended to be at? By that I mean specifically Ansit Ford, the village, and the waterfall? As far as I can tell, none of the actual waterfalls to the east in the "Kingbreaker" adventure path are situated at a mountain (at least the descriptions of the rivers running through the mountain ranges therein do not state or imply that they have a waterfall). There are two rivers described as having at least one waterfall but neither of those rivers actually originate from a source in the mountains nearby (if I recall correctly, they do connect with the rivers that have their source from the nearby mountain ranges). I can obviously put waterfalls wherever I want, I am just perplexed and curious if I did indeed missed the specific hexes on the map. Nevermind; ignore my previous post. I see now that the locations of the encounter areas are up to the GM to decide where to put (as every "Kingbreaker" campaign will be different and the progress of any given pcs' nation is variable). It was just that the description of the area with the waterfall threw me off and I was trying to figure out which hex it was. Good thing I have png images of waterfalls that I can place on the virtual overland maps I have for the campaign so it's easy enough for me to plonk a waterfall as needed. Truth! Also, remember that every hex is like 100 square miles or so, and you could certainly have any number of little rivers that don't show up on the big overland map. I'd place it somewhere in he hills off on the eastern frontier, but that's about as tightly as I'd specify it. You could put it anywhere!